In honor of Rock Lobstah and his recent opals, I'm sharing one of mine. I finished this a while back, but finally got an ok picture, so here it is. Sorry about the reflection, I'm still trying to figure out lighting. I hope the rest of you will share your work, comment, ask questions, critique. Maybe we'll learn something...or at least see some great stones. WOooooohoooooo! Another pretty rock pic thread! This stone is the one I mentioned with the potch under it. I have to say this is the one time where the pic looks better than the stone. Stone's great but pic is insane, though. Should I just make that into an oval all the way around? Seems to be asking for it. Here's a shot of the potch. As you can see, I don't dare dome it, but maybe I should cut down the base as it is thick? you can see there is a little crack line in the middle, not bad but still there. Rock my man, those are awesome! I wouldn't make an oval of the first stone. Leave as is. It's gorgeous. beautiful stuff lads, im loving this post. love the sound of that favourite moment, an artist at one with his work!! Nice stuff Rock...pity about the crack in that small stone, but the last couple look great! The other one with the potch problem looks good too...you made it sound like a write-off, but I think not. As for whether or not to shape it to a true oval...who knows? In my opinion, it depends on what you're going to do with it. Some bench jewelers will only work with calibrated sizes, but I think with opal you'll find more tolerance for odd shapes...especially with such nice material. Good work...makes me want to get out the pricey rough and go to work. Please keep image width at a maximum of 450 pixels. Otherwise it distorts the pages. Nice looking opals all around! 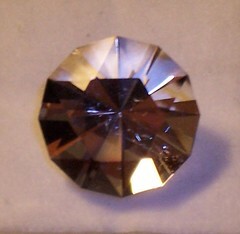 I tried taking a pic of a faceted stone once, ended up with a really bright spot! Guess I need me some lighting rather than using a flash (kinda knew that but what the hey, isn't digital great?). Hi all, just finished it, a 14mm, 8.34ct natural Quartz that may be a sold stone. I hope... Slightly included as you can see, amazing what inclusions do in well cut clear stones. I have a 30ct flawless piece of rubellite rough that I am waiting to cut, I don't want to mess it up. But when I see this stone I think, man if that was the rubellite it would be a $2,000 stone, or more. Last edited by MaineGemCutter on Sat Oct 20, 2007 4:49 am, edited 1 time in total. Yes, that is a cool shot, and I like the ones below that show the inclusions too. Be sure and lets us see a shot of that rubelite when it's done. The condensation from my hands is clouding the stone, but I just think it's a cool pic. I doubt that you can be a worse photographer than me. Please, just jump in. Ok, here's an aqua, just to look at something other than cabs. The rough was not quite as described, but I kept it anyway because of the color. The stone is clean except for a small feather in the upper right corner. The rest of the spots are dust, and fuzz from the box. Heres' my question: would you have cut this one as I did (for yield) or trimmed out the feather to get a completely clean stone? The stone is 7x7x5.6mm and is currently at 2 ct. exactly on my scale. The cut is called "Mistress" by Jeff Graham. You could go on gemval.com, put in included at 2ct and clear at, what? 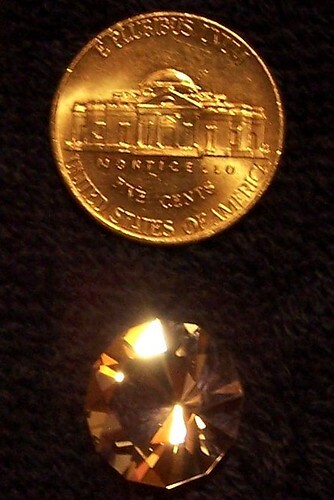 1.3ct?, and see the price difference....2ct..SI2 at $117.....OR....1.3ct..."eye clean" VVS at $148......UH OH! I hear you. I have in fact done just that. I really don't trust the figures that come out of gemval though...I think they're based on common commercial stuff. I don't know that many custom cutters, but the ones I do know wouldn't sell a stone of that color and size at that price...and they sell plenty of stones. <shrug> I think there was a similar discussion on the USFG list a while back...no one there liked the price quotes either. I decided to leave the inclusion; it's really not as bad as the enlarged picture makes it. Given that it's tucked up under some crown facets, you sort of have to know where to look to see it with the naked eye. Of course, it drives ME nuts, but no one that I've shown it to even noticed. So...does that mean I can count it as "eye clean"? Last edited by HME on Sun Aug 19, 2007 2:23 am, edited 1 time in total.